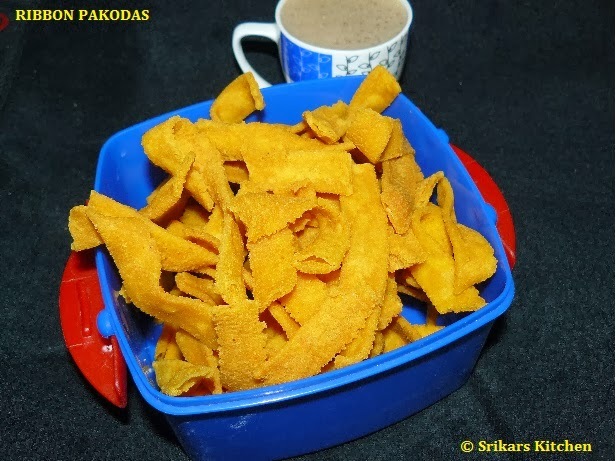 Ribbon pakoda is one of the best snack recipe. Normally its the one of the important dish of diwali recipes and my daughters favourite recipe.It is a best tea time snack as well.This is one of the spicy,crisp and easy to make Recipe.Instead of chilli powder, we can add ground pepper powder as well. Take a bowl add rice flour,besan, redchillipowder, salt,hing,butter & mix well. Heat oil in a pan & Take a murukku maker which is specialised equipment just for varieties of murukku. Place the dough in the bottom of the maker & squeeze by applying pressure from he top. Rotate by giving pressure to make it different shapes. Allow to cook both sides.Keep this pakodas on air tight container.